a new Icecrown Citadel themed battlefield. It is already possible to pre-purchase 50 packs from the new expansion for 49.99 USD / 49.99 EUR / 44.99 GBP. 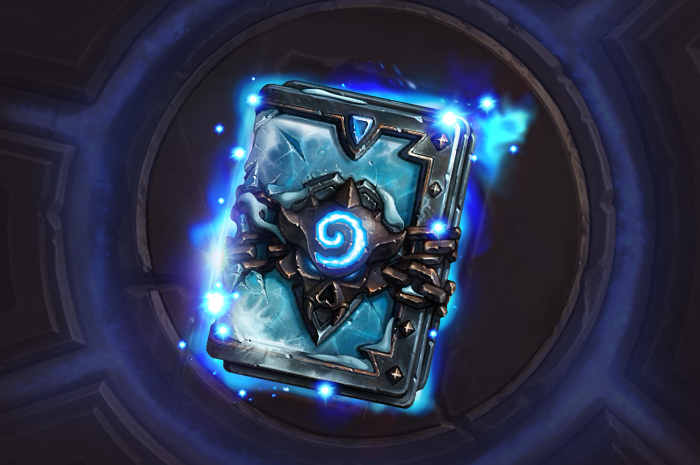 The reward for pre-purchasing is the new Frostmourne card back, see picture below. Lifesteal is a new keyword introduced in Knights of the Frozen Throne. When a card with Lifesteal deals damage, your hero is healed for the same amount. Note that this effect already exists in the game. It was introduced with Mistress of Pain in Goblins vs Gnomes and used again for Wickerflame Burnbristle in Mean Streets of Gadgetzan. It is now being expanded to not only minions, but also spells, and maybe weapons and hero cards. Choose a Deathrattle (Secretly) is a new keyword introduced in Knights of the Frozen Throne. It allows you to choose the Deathrattle of a card when you play it and that choice is not revealed to your opponent. it provides a new hero power. Druid / Malfurion the Pestilent — This card replaces Malfurion with Malfurion the Pestilent, summons 2 1/2 Poisonous Spiders or 2 1/5 Scarabs with Taunt, grants 5 Armor, and provides you with Plague Lord as a new Hero Power. It grants you 3 Attack or 3 Armor. Hunter / Deathstalker Rexxar — This card replaces Rexxar with Deathstalker Rexxar, deals 2 damage to all enemy minions, grants 5 Armor, and provides you with Build-A-Beast as a new Hero Power. It allows you to discover two random beasts and combine their stats, costs, and card text into a new composite Beast. For more information about Build-A-Beast, please refer to this post on reddit. Mage / Frost Lich Jaina — This card replaces Jaina with Frost Lich Jaina, summons a Water Elemental, gives you 5 Armor, grants Lifesteal to your Elementals for the rest of the game, and provides you with Icy Touch as a new Hero Power. It deals 1 damage and summons a Water Elemental if it kills a minion. Paladin / Uther of the Ebon Blade — This card replaces Uther with Uther of the Ebon Blade, equips a 5/3 Lifesteal weapon, grants 5 Armor, and provides you with The Four Horsemen as a new Hero Power. This summons a random 2/2 Horseman (there are 4 different ones, as in World of Warcraft); if you manage to summon all Four Horsemen, the enemy Hero dies. Priest / Shadowreaper Anduin — This card replaces Anduin with Shadowreaper Anduin, destroy all minions with 5 or more Attack, grants you 5 Armor, and provides you with Voidform as a new Hero Power. This Hero Power deals 2 damage and refreshes (i.e., you can use it again) whenever you play a card. Rogue / Valeera the Hollow — This card replaces Valeera with Valeera the Hollow, gives your Hero stealth until the next turn, grants you 5 Armor, and provides you with Shadow Reflection as a new Hero Power. Whenever you play a card, it becomes you Hero Power (meaning that it only works on cards that cost 5 Mana or less), until the end of the turn or until you play a new card. Shaman / Thrall, Deathseer — This card replaces Thrall with Thrall Deathseer, transforms all your minions into random ones that cost 2 more, grants you 5 Armor, and provides you with Transmute Spirit as a new Hero Power. It transforms a friendly minion into a random one that costs 1 more. Warlock / Bloodreaver Gul'dan — This card replaces Gul'dan with Bloodreaver Gul'dan, summons all friendly minions who died this game, grants 5 Armor and provides you with Siphon Life. It deals 3 damage and has Lifesteal. Warrior / Scourgelord Garrosh — This card replaces Garrosh with Scourgelord Garrosh, equips a 4/3 Shadowmourne that also deals damage to adjacent minions, grants 5 Armor, and provides you with Bladestorm as a new Hero Power. It deals 1 damage to all minions. On July the 7th, Yong Woo (Lead Game Producer for Hearthstone) announced on Twitter that Death Knight hero cards would be available in the Arena. In this section, we list all the cards (out of the 135) that have been revealed. Kuddos to HearthPwn for the images. Both Mistress of Pain and Wickerflame Burnbristle have had their card text changed to Lifesteal. In addition, their interaction with Auchenai Soulpriest has been changed. Previously, dealing damage with either of these cards with an Auchenai Soulpriest on your side of the board results in your hero's death. For example, if you dealt damage with Mistress of Pain, the healing you received was converted in damage by the Auchenai Soulpriest and that damage was considered to have been dealt by the Mistress of Pain, triggering another heal that was converted in damage and so on, until your hero died (see video). As of Knights of the Frozen Throne, when Auchenai Soulpriest is in play and a Lifesteal effect happens, the healing done to your hero deals damage instead and the effect stops there (no more chain reaction). Dreadsteed's text was changed from Deathrattle: Summon a Dreadsteed. to Deathrattle: At the end of the turn, summon a Dreadsteed. Fandral Staghelm + Wrath now first deals 3 damage and then 1 damage + card draw, instead of 4 damage + card draw. It also now benefits from Spell Power twice (for example +1 Spell Power would result in 5 damage before and 4 + 2 now). Fandral Staghelm + Starfall now deals 5 damage to a minion first and then 2 AoE damage. Kalimos, Primal Lord + Hallazeal the Ascended combo: Invocation of Air no longer heals you through Hallazeal. 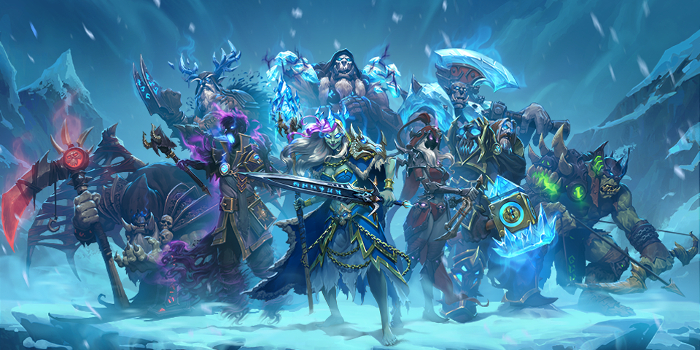 Knights of the Frozen Throne brings 8 single-player missions, starting with The Prologue and then proceeding with battles against the denizens of Icecrown Citadel, before a final showdown against the Lich King, who will play differently, depending on which class you choose to face him. Single-player missions cost nothing and finishing them will reward you with 3 Knights of the Frozen Throne card packs. Completing the prologue mission will reward you with a random Death Knight hero card. We learned from Dave Kosak in a video posted on the 27th of July that the missions replace the solo adventures and do not reward cards. They do reward a golden Paladin hero (Arthas) after you defeat the Lich King with all classes. The idea is that the missions explain the lore behind the new expansion and do not force players to do the content if they are not interested in it. 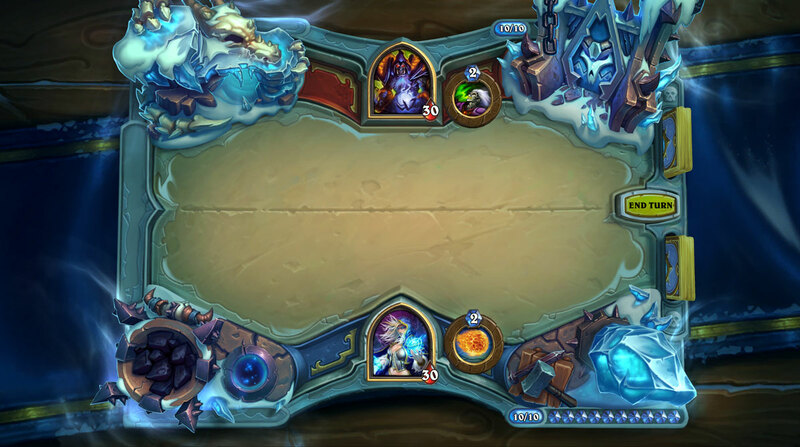 A new battlefield will be released with Knights of the Frozen Throne. It has an Icecrown Citadel theme, as you can see below. 08 Aug. 2017: Added all remaining cards. 07 Aug. 2017: Added more reveals. 06 Aug. 2017: Added more reveals. 04 Aug. 2017: More reveals. 03 Aug. 2017: Added today's reveals. 02 Aug. 2017: Added today's reveals. 01 Aug. 2017: Added reveals from 31st of July. 30 Jul. 2017: Added Necrotic Geist, Cobalt Scalebane, Gnomish Vampire, and Val'kyr Soulclaimer. 29 Jul. 2017: Added Ice Walker and Meat Wagon. 28 Jul. 2017: Added the numerous cards revealed on the 28th of July as well as Frost Lich Jaina. Added new Choose a Deathrattle (Secretly) mechanics. 27 Jul. 2017: Added Bolvar, Fireblood, Light's Sorrow, Corpsetaker, and Bonemare. Renamed Abomination Archer to Abomination Bowman. Added Dave Kosak's video on missions and the new Paladin hero, Arthas. 27 Jul. 2017: Added Abomination Archer and Fatespinner. 27 Jul. 2017: Added Bearshark and Hadronox. 26 Jul. 2017: Added Bring It On!, Coldwraith, Sindragosa, and Voodoo Hexxer. Renamed Vampiric Poison to Leeching Poison. 26 Jul. 2017: Added Vampiric Poison. 26 Jul. 2017: Added Mountainfire Armor, Nerubian Unraveler, Professor Putricide, and Ghastly Conjurer. 25 Jul. 2017: Added Blood Razor and Prince Taldaram. 25 Jul. 2017: Added Blood Queen Lana'thel. 25 Jul. 2017: Added Plague Scientist and Ice Breaker. 24 Jul. 2017: Added Ticking Abomination card. 11 Jul. 2017: Added Lich King interview. 08 Jul. 2017: Added more information about Deathstalker Rexxar and added changes to existing cards. 07 Jul. 2017: Added new expansion hub for Knights of the Frozen Throne.